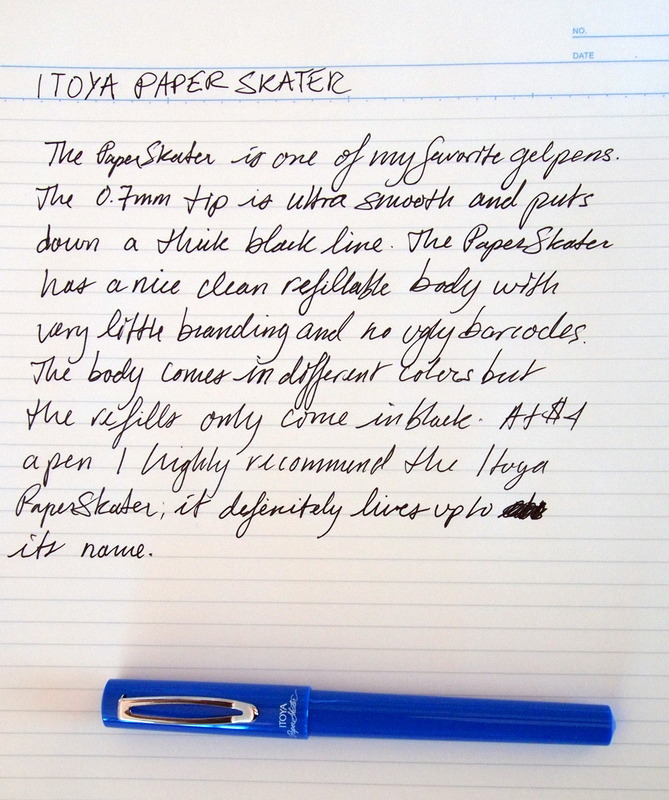 The Itoya Paper Skater is one of my favorite non-fountain pens. It features a low resistance gel ink rollerball refill in a simple plastic body. The Paper Skater glides across the paper effortlessly and lays down a bold deep black line. The plastic body is very clean and dignified without any ugly logos or barcodes. The cap has a satisfying click and features Itoya’s signature elliptical clip. The Paper Skater comes with a blue, black or white body a black 0.7mm refill. I incorrectly stated in the written review that you can only get black refills; you can actually get blue, purple, green, and red; you just have to purchase them separately. Also, you can fit the 1.0mm and 0.7mm Itoya AquaRoller refill in the Paper Skater. If you don’t mind a thicker line I highly recommend the Paper Skater; it is a pleasure to use.